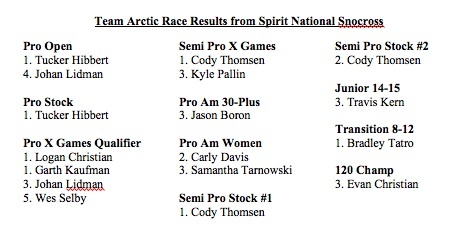 This entry was written by arcticspeedway, posted on November 29, 2010 at 3:55 PM, filed under Snowmobile Racing and tagged Arctic Cat, Cory Davis, Dan Ebert, ISOC, ISOC National Tour, Mike Kloety, Race, Racing, Sno Pro 600, Snowmobiles, speedway, Team Arctic, Tucker Hibbert. Bookmark the permalink. Follow any comments here with the RSS feed for this post. Post a comment or leave a trackback: Trackback URL.